One more bit on the Ross Gelbspan / James McCarthy situation, to drive home a larger point concerning the problem of critical information missing from mainstream media news discussions of the global warming issue. 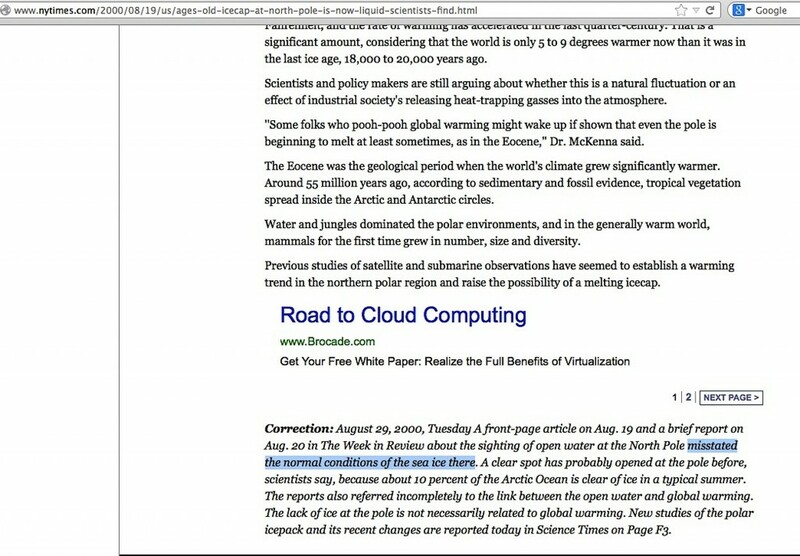 In my 10/18/13 piece at JunkScience about IPCC scientist James McCarthy being the person who suggested to Gelbspan that skeptic climate scientists had ‘mysterious’ funding sources, I first pointed out the New York Times statement McCarthy made about Arctic ice melt that prompted the paper to issue a detailed retraction, and how Gelbspan reproduced the article at his website minus the correction. When James McCarthy of Harvard University, cochair of a working group for the Intergovernmental Panel on Climate Change, announced his discovery last month of a mile-wide stretch of open water at the North Pole, it triggered a national catharsis. Despite controversy over the uniqueness of the polar meltdown, the finding loosed a barrage of pent-up fears about climate change that have been building just below the surface of public discourse. From Time magazine to the New York Times to the Late Show with David Letterman, commentators began weighing in. His piece was written a month after the NY Times had its correction publicly made. 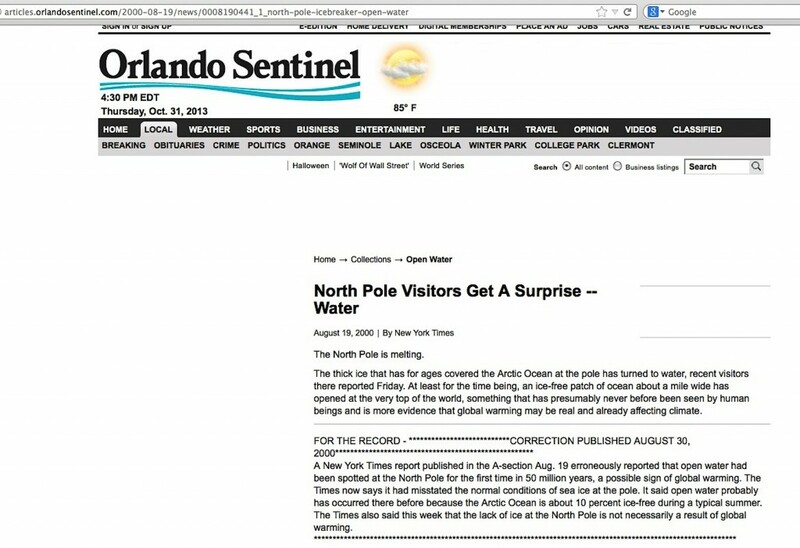 Other papers carrying the article and its correction were out there. The NY Times additionally took an extra effort to explain the situation in an article appearing the same day as their 8/29 correction, which only further undermined McCarthy’s spectacular claim. The elemental question is whether Gelbspan did not do basic due diligence to be certain McCarthy’s claim was accurate, and was totally unaware of McCarthy’s misstatement along with all the efforts to note the correction. Or did he deliberately ignore the correction, since it would have hugely undermined his article? Either way, this does not look good for him. This same elemental question applies in a far larger way to the treatment of the issue by the mainstream media. In one of my other recent articles, I describe how the PBS NewsHour’s 1996-to-present bias in its global warming discussion segments presents only four instances where any semblance of skeptic science points were mentioned out of more than 355 on-air broadcast discussions (plus a few online pages directly relating to some of those segments). The ratio has gotten worse, but that’s another story. The elemental question is whether the PBS NewsHour is totally unaware of the detailed extent of skeptic climate scientist criticism of man-caused global warming, or are they deliberately ignoring that and not undertaking due diligence to be certain their pro-global warming guests’ viewpoints tell the full the story? This entry was posted in mainstream media reporting, Unfair Media Balance and tagged James McCarthy, PBS NewsHour by Russell Cook. Bookmark the permalink.